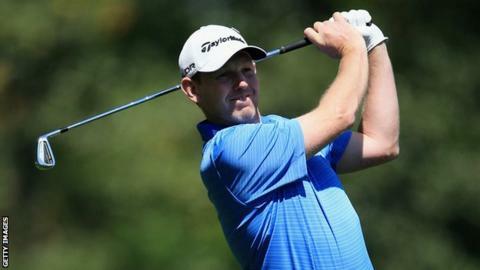 Stephen Gallacher said he was "a wee bit disappointed" despite an excellent first round on his Masters debut. The 39-year-old Scot shot a one-under-par 71 for a share of 12th place. Gallacher was three under par after a flawless front nine but leaked three bogeys in a row before picking up another birdie at the 15th hole. "It's a special place, one in a million place," he said. "It's hard to get that out of the way and just concentrate on the golf." Compatriot Sandy Lyle raced to three under after the first four holes but ended the day on 76, tied for 67th. The 1988 champion was still in red figures when he made par at the 10th. However, the 56-year-old dropped two strokes at the 11th and bogeys followed at the 12th, 14th and 16th holes. Gallacher made his first appearance at Augusta National look easy on the front nine and is just three shots behind leader Bill Haas, with defending champion Adam Scott on 69. "At the end of the day it's a golf tournament, so you've got to be trying to play the course," he said. Having fallen back to level par, Gallacher missed a short eagle putt at the 15th before sinking a longer one for his fourth birdie of the day. And he was a picture of calm when knocking in a short putt for par on the last green. "I played practice rounds with Sandy Lyle and Jose Maria Olazabal, who know what it takes to win round here, and they told me not to go for flags, to go for positions and that's what I did," he told Sky Sports. "I played pretty perfectly on the front nine, just hitting it where I wanted to hit it. "I hit one poor drive at the 10th, the drives at 11 and 12 were near perfect but all of a sudden you're back level. "I was happy with a good up and down at the last to stay in the red."